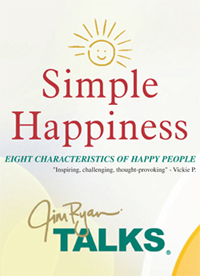 This DVD was recorded live based on Jim Ryan’s program “Simple Happiness, 8 Characteristics of Happy People”. 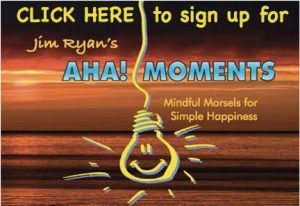 This multi-part DVD was a seven-part DVD crafted by Jim Ryan with the majority of his enlightening lessons. The book is read by Jim Ryan and contains brief meditative guitar interludes between chapters. 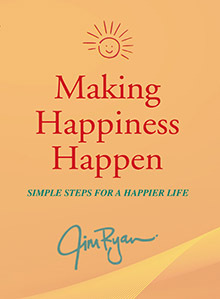 This multi-part CD is the audio of the DVD “Making Happiness Happen”. 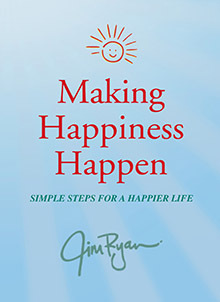 Making Happiness Happen was a seven-part DVD crafted by Jim Ryan with the majority of his enlightening lessons. The CD Version is great for a car where video will be distracting. Just don’t follow along with the meditation exercises while driving. 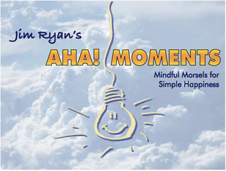 This is the second collection of AHA Moments bundled together into a book. 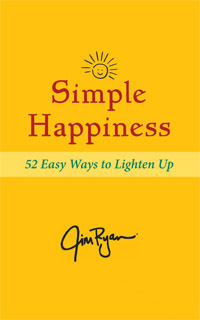 Jim has just released his latest edition of his inspirational book, Simple Happiness, 52 Easy Ways to Lighten Up. Tens of thousands of readers have been encouraged to live their best lives now. Inspired by the overwhelmingly positive feedback, Jim had decided to bring his book to the national scene. His book is now available in bookstores, libraries and gift shops all over America. It is also available on Kindle,Amazon, and Smashwords. Simple Happiness was written from the heart with the intention to give you comfort and hope. Comfort that no matter where you find yourself, it is just where you are supposed to be. It offers hope that no matter where that place is, it can always get better, much better. It represents comfort and hope that true happiness and joy are available to everyone – including you! People who read the book are often so moved by it that they pass it on to someone they care about. I invite you to open that door of opportunity I like to call “Simple Happiness” and as you do so, may you find what your heart desires.